After getting an awesome response last year, LITRAPTURE is back!! 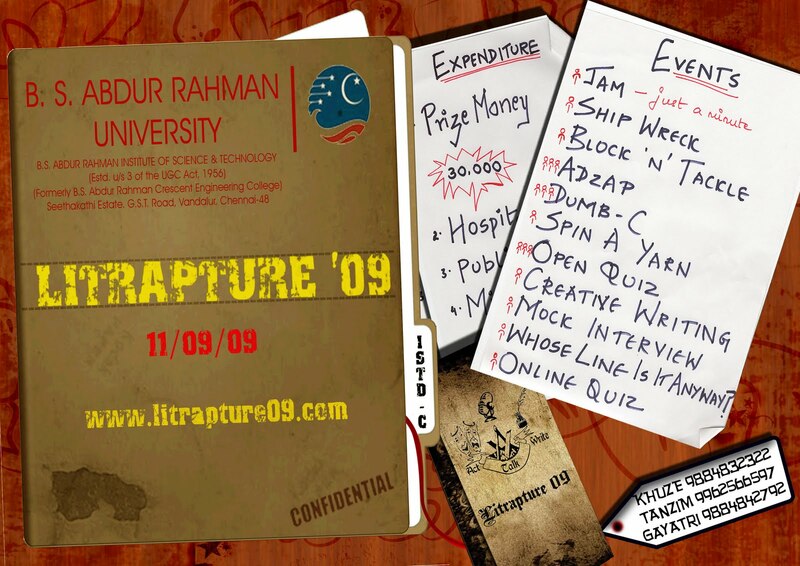 B.S.ABDUR RAHMAN UNIVERSITY formerly BSA CRESCENT ENGINEERING COLLEGE introduces LITRAPTURE09, a one of a kind inter collegiate literary fest for students from all streams engineering, medical, arts and even law. Last year the event drew crowds from all top colleges like SSN, SRM and MEASI and arts colleges like New College, Stella, Ethiraj, WCC, Loyola,MOP, etc. So if you live in Chennai and are a student then please do come to BSA UNIVERSITY on friday, the 11th for the literary extravaganza! Events include JAM, block n tackle, spin a yarn, DUM-C, shipwreck, ADZAP, mock interview, an online quiz- E-mystic, the dubut of the litrapture open quiz and the grand finale- whose line is it anyway. Celebrity judges for the events VJ Craig/ Cary from SS Music will be present. For further details visit www.litrapture09.com. top colleges like measi??! LOL! Be happy i said top.But hey top as in not top like highest college… you have only two floors di..chhii….